At the Diaspora Museum in Tel Aviv, Zola reviews the history of the Jewish temples, from Solomon’s to Herod’s. The Roman siege of 70AD, depicted behind Zola, is symbolic of the many empires that have come against God’s holy place. 00:36 THE ASSAULTS ON THE TEMPLE ITSELF. 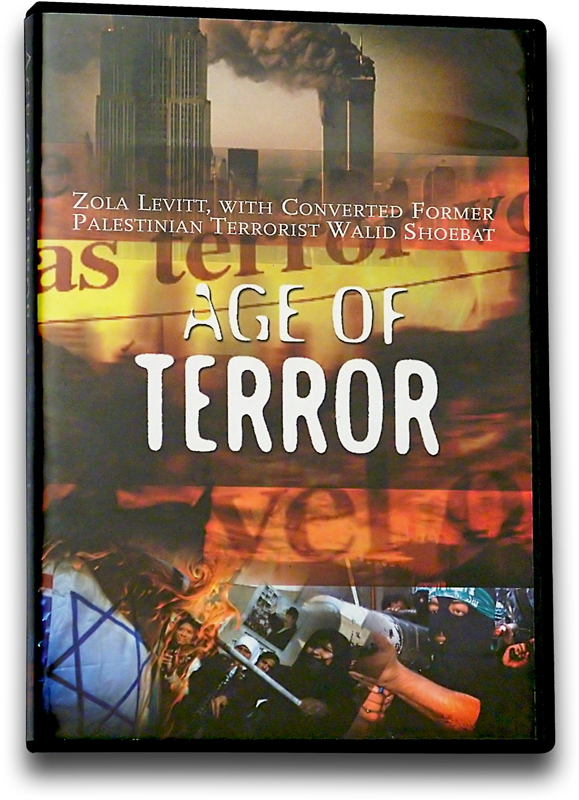 00:45 AND WE'RE GOING TO TALK WITH WALID SHOEBAT, OUR GUEST WHO WAS A PALESTINIAN TERRORIST. 00:54 AND HE'S GOING TO TELL YOU ABOUT >>IT LATER IN THE PROGRAM. 00:56 FIRST WE'LL GO TO LOCATION AT THE CENTER OF THE EARTH. 01:06 WHERE THEY HAVE MANY DISPLAYS OF >>THE JEWISH PAST. 01:16 OVER THE MANY CENTURIES THAT THEY WERE IN A DIASPORA. 01:19 WE HEAR BACKGROUND NOISE OF ADULTS, TOURS BEING TAKEN THROUGH THIS MUSEUM. 01:36 RIGHT THROUGH THE STREETS OF ROME AFTER THEY RAIDED THE TEMPLE AND THREW IT DOWN. 01:42 BUT, THAT HAD A HISTORY ACTUALLY. 01:51 NOT THE TEMPLE ARTIFACTS, BUT GOODNESS, THE 10 NORTHERN TRIBES OF ISRAEL ALTOGETHER. 01:57 NOW NEBUCHADNEZZAR, WHO LAID SIEGE TO JERUSALEM FROM 605 TO 586 B.C. 02:08 JUST LIKE THE ROMANS AFTER THEM, >>TOOK THEM TO BABYLON. 02:17 AND OF COURSE, IT'S THE PASSAGE >>ABOUT THE HANDWRITING ON THE WALL. 02:21 GOD SAID, IN EFFECT, THE PARTY'S OVER. 02:25 IN 167 B.C. ANTIOCHUS, A GRECO-SYRIAN CAME INTO JERUSALEM. 02:40 AND THE MACABEE FAMILY, "MACABEE" MEANS HAMMER. 02:43 THE MACABEES LATER REVOLTED AGAINST HIM AND THREW HIM OUT >>AND RE-CONSECRATED THE TEMPLE. 03:03 AND WE HAVE AN EIGHTH DAY >>FESTIVAL OF LIGHTING OF CANDLES. 03:11 RAZED IT TO THE GROUND LIKE NEBUCHADNEZZAR HAD THE FIRST TEMPLE. 03:19 AND THAT IS WHAT IS PICTURED IN THE FRESCO. 03:21 THEY WERE PROUDLY SHOWING JEWISH ARTIFACTS. 03:28 BUT SOMEHOW WE PREVAILED AGAINST >>THE BARBARIC JEWS AND HERE IS THE PROOF OF IT. 03:39 AND HAVE A PARADE AND MARCH DOWN THE STREET AND SHOW THE PEOPLE >>WHAT YOU ACCOMPLISHED. 04:18 THE PERSON IS SORT OF ERASED FROM HISTORY. 04:23 THEN MAYBE PEOPLE WILL FORGET ABOUT THE JEWISH TEMPLE AND SO ON. 04:26 IN SEVERAL CASES IN HISTORY THE TEMPLE HAS BEEN UTTERLY REPLACED. 04:38 WHERE YOU REPLACE THE IDEALS OF >>THE PEOPLE. 04:40 THE LIBERAL CHURCHES BELIEVE THEY HAVE REPLACED ISRAEL AS THE NEW CHOSEN PEOPLE. 04:48 SOME CHURCHES TEACH THIS GOBBLEDYGOOK. 04:59 BUT LITERALLY REPLACING THE BUILDING WAS DONE BY HADRIAN THE ROMAN EMPEROR IN 135 A.D.
05:35 TO KEEP THE JEWISH TEMPLE AWAY >>AND IT HAS WORKED. 05:39 THEY HAVE BEEN UP THERE 13 CENTURIES. 05:52 AND THEY THOUGHT THE DOME OF THE >>ROCK WAS SOLOMON'S TEMPLE. 05:56 IT'S VERY BAD READING OF THE OLD TESTAMENT. 05:58 2 TEMPLES HAVE BEEN WRECKED; SOLOMON'S AND ZERUBBABEL'S OR HEROD'S HAD BEEN TAKEN DOWN. 06:04 BUT, THEY CALLED THIS, THE DOME THAT THEY FOUND "TEMPLUM DOMINI". 06:25 THE OLD PILLARS OF THE TEMPLE OF >>JUPITER AND ALL OF THAT ON JEWISH LAND. 06:30 SO, IT WAS, I'VE SAID IT BEFORE BUT THE TEMPLE SITE HAS ALWAYS >>BEEN A SITE OF CONFLICT. 06:39 AND IN THE PRESENTS DAY THE >>CONFLICT OVER THE MOUNT GOES ON. 06:47 AND THE MUSLIMS CAME, THEY NAMED THEMSELVES PALESTINIANS IN 1964. 06:54 THE MEDIA TAKES THEIR SIDE OF THINGS THINKING THAT THEY ARE SOME KIND OF UNDERDOG. 07:00 IN THE MEANTIME THEY ARE TRYING TO DIG OUT THE JEWISH TEMPLE AND >>TAKE OVER THE TEMPLE MOUNT. 07:17 THE SO-CALLED "TRIBULATION TEMPLE"
07:30 WHEN ISRAEL IS THE HEAD OF THE NATIONS, SO SCRIPTURAL PROPHECY >>TELLS US. 07:36 AND FINALLY, THE PERIOD OF ETERNITY, WAY AT THE END OF THE BIBLE. 08:19 WE ALSO HAVE NO MORE CARRYING >>OFF OF THE PRECIOUS ARTIFACTS OF >>THE JEWISH TEMPLE. 08:39 AND OUR CATALOG WITH VIDEOS, BOOKS AND MUSIC. 08:47 INCLUDES READING PACKETS, TEACHING CASSETTES AND MAIL-IN TESTS. 08:56 AND THE HOLY LAND EXPERIENCE >>THEME PARK IN ORLANDO FLORIDA? 09:09 I SHALL STAND WITHIN THE WONDER >>OF YOUR WALLS, OH JERUSALEM. 09:18 BEAUTIFUL FOR SITUATION, THE JOY OF THE WHOLE EARTH. 09:24 SURELY THE LORD HAS BLESSED THEE >>AND MADE HIS FACE SHINE UPON THEE. 09:29 JOIN ZOLA LEVITT ON HIS NEXT TOUR OF ISRAEL. 09:35 COME TO ZION WITH SONGS AND EVERLASTING JOY. 09:42 COME, WORSHIP IN THE SPLENDOR OF >>HIS HOLINESS. 09:48 WELL, VISIT THE TEMPLE SITE IN ISRAEL. 09:55 THE AL AQSA MOSQUE, WORLD FAMOUS, AT LEAST IN TERRORISM CIRCLES. 10:04 AND OF COURSE THE WESTERN WALL, >>THE REMNANT OF HEROD'S TEMPLE WHERE THE JEWS WORSHIP. 10:11 PART OF THE TOUR AND THERE'S VERY HAPPY PARTS OF THE TOUR. 10:17 I LOVE TO GO. 10:20 AND I STILL HAVE TROUBLE FALLING >>ASLEEP THE NIGHT BEFORE I GO. 10:25 I SAY IT ALL THE TIME. 10:33 YOU CARRIED A BOMB INTO THE TEMPLE MOUNT. 10:37 MY MISSION WAS TO BLOW UP BANK >>LEUMI IN BETHLEHEM. 10:44 WITH A BOMB MAKER IN THE OLD CITY OF JERUSALEM. 10:48 WHY WERE YOU IN PRISON TO START WITH? 10:53 AND I WAS GOING DEMONSTRATIONS, >>I WAS RIOTING ALL OVER OUR VILLAGE. 10:57 I'M GLAD YOU CAME TO THE LORD, >>SO BOLD A MUSLIM AS YOU, MAKE A VERY GOOD CHRISTIAN. 11:31 OVER THERE THEY'RE CALLED THE RELIGIOUS POLICE. 11:34 THEY'RE SUPPOSED TO KEEP ORDER >>ON A RELIGIOUS SITE. 11:44 SMUGGLE WEAPONS AS WELL AND TERRORISTS, AS WELL. 11:47 SO, THEY ARE ALL USED. 11:48 SO HERE I WAS ALLOWED IN BY THE POLICE TO AVOID THE CHECKPOINTS >>IN THE OLD CITY OF JERUSALEM. 11:56 SO YOU WOULDN'T HAVE TO GO BY THE ISRAELI CHECKPOINT. 12:02 WHICH SENT ME RIGHT TO THE BUS STOP IN JERUSALEM, THE OLD BUS STOP. 12:07 YOU PASSED THROUGH THE ENTIRE TEMPLE SITE WITHOUT BEING DETECTED. 12:13 SO, I HAD THESE EXPLOSIVE >>CHARGES IN THE HOLY OF HOLIES, >>IF YOU WILL. 12:15 I WOULD HAVE STOPPED YOU AND SAID WHAT'S AN ARAB KID DOING >>CARRYING A JEWISH LOAF OF BREAD. 12:19 ARAB BREAD IS BETTER ANYWAY. I EAT IT ALL THE TIME. 12:23 WHAT'S AMAZING ABOUT THE STORY IS WE HAD TWO LOAVES OF BREAD. 12:26 ONE LOAF WAS TO COVER THE OTHER ONE SO THEY WON'T SEE THE TIMER. 12:29 SO I SAID TO HIM, WHY DID YOU HAVE THESE TWO LOAVES? 12:32 HE SAID, WELL, TO COVER THE TIMER. 12:33 ONE OF THEM IS GOING TO DIE AND THE OTHER ONE IS GOING TO LIVE. 12:38 HE SAID, TAKE THAT AND EAT IT. 12:39 REMINDING ME OF A MESSIANIC ISSUE OF GOING TO BETHLEHEM. 12:41 THE BANK WAS RIGHT NEXT TO THE >>NATIVITY CHURCH, YOU KNOW, THE BIRTHPLACE OF JESUS. 12:46 THERE I TOOK IT AND PLACED IT ON >>THE ROOF AND IT EXPLODED. 12:51 I REMEMBER HOW YOU TOLD THIS STORY BEFORE. 12:53 YOU SAW CHILDREN ON THE STREET >>AND JUST COULDN'T BLOW IT UP THEN. 12:57 I USED TO ALWAYS STARE AT GOLGOTHA, ON THE BUS STOP. 13:01 I NEVER KNEW WHAT THE PLACE WAS. 13:10 DID NOT KNOW WHAT YAD VASHEM WAS, DID NOT KNOW WHAT THE ISRAEL MUSEUM WAS ABOUT. 13:14 MY MOTHER TOOK ME A COUPLE OF >>TIMES BECAUSE SHE WAS ALLOWED TO >>TAKE ONE CHILD. 13:18 IF SHE TOOK ALL 3, OF COURSE, SHE WOULD ESCAPE TO AMERICA. 13:27 AND SHE WENT TO ALL THESE PLACES. 13:29 SHE WANTED TO GET CIVILITY, >>IF YOU WILL, OUT OF THE PRESSURE >>SHE WAS LIVING IN. 13:39 BECAUSE IF SHE GETS ALL OF HER CHILDREN WITH HER SHE'S GOING TO RUN OVER THE BORDER AND BE GONE? 13:44 THAT'S RIGHT. >>THAT'S TERRIBLE. 13:45 SHE ATTEMPTED TO ESCAPE FOR 35 YEARS AND SHE KEPT HER FAITH SECRET. 13:58 YOUR BROTHER'S FIRST NAME AND YOUR SISTER'S FIRST NAME. 14:00 NONE OF THEM IS A MUSLIM NAME. >>IT'S ALL NEUTRAL NAMES. 14:15 AND CAN'T EVEN TAKE ALL THEIR CHILDREN WITH THEM SOMEWHERE. 14:18 THAT'S RIGHT, BUT SHE BLACKMAILED ME. 14:23 I'M GOING TO TELL HIM ABOUT YOU >>STEALING MY CIGARETTES. 14:29 LOOK, A DEALS, A DEAL. EVEN WITH YOUR MOTHER. 14:44 YOU COULDN'T BLOW IT UP BECAUSE THE CHILDREN WERE THERE SO YOU THREW THE BOMB UP ON THE ROOF. 14:49 THAT'S RIGHT AND IT EXPLODED 5 MINUTES LATER. 14:50 IF I HAD BEEN THERE, ZOLA, >>AT 6 PM, I WOULD HAVE DIED AS A >>SUICIDE MARTYR. 15:02 WELL, HOW DID I GET SAVED OUT OF >>THAT SITUATION? 15:04 HOW DID I GET SAVED OUT OF THAT SITUATION? 15:10 AND JESUS CHRIST SAID I'VE WORK FOR YOU. 15:13 GET RID OF THAT BOMB AND LET'S GO. 15:16 AS I LOOK BACK AT, IF I SEE >>MYSELF ON YOUR SHOW BEFORE 1993, >>I WOULD REND MY CLOTHES. 15:23 I WOULD SAY, NO WAY. IT'S IMPOSSIBLE FOR ME. 15:25 IT'S UNTIL DEATH DO US PART >>WHEN IT COMES TO BEING A MUSLIM. 15:29 ISLAM HOLDS OUR SOUL VERY STRONG. 15:32 IT'S VERY DIFFICULT TO LEAVE THE >>ISLAMIC RELIGION. 15:35 THERE'S A LOT OF STRUGGLES YOU >>GO THROUGH. 15:37 THERE'S PERSECUTION, YOU LOSE ALL YOUR FAMILY. 15:50 AND THIS IS WHAT I STARTED SAYING IN 1993. 15:52 I SAID THEY ARE GOING TO DO THIS. 15:54 THEY'RE GOING TO BLOW YOUR BUILDINGS. 15:55 THEY'RE GOING TO BEHEAD YOU. AND PEOPLE WEREN'T LISTENING. 16:08 CUTTING THE HANDS AND FEET FROM >>OPPOSITE SIDES. 16:11 IT'S BECOMING A REALITY. 16:13 IT'S NOT A MYTH. IT'S REAL. 16:16 YOU SEE IT ON TV. YOU SEE IT ALL OVER. 16:18 YOU HEAR ABOUT IT EVERY SINGLE DAY. 16:20 WE'RE LIVING IT, ZOLA. 16:22 AND IT'S GOING TO GET MUCH WORSE. 16:30 THEY ESTABLISHED THE SHARI'AH LAW THAT WAS STRICT ISLAMIC COURTS. 16:47 IN FRONT OF A LARGE CROWD, 52 PERFORMANCES, SO TO SPEAK. 16:52 VERY INTERESTING YOU MENTIONED THAT. 16:54 THEY ESTABLISHED, YOU SAID, SHARI'AH LAW. 16:58 ANTICHRIST, WHEN HE COMES, HE CHANGES TIMES AND LAWS. 17:04 IT'S NOT THE ORDINANCES OF THE >>COSMOS AS WE THINK. 17:07 BUT, IT'S THE LITERAL CALENDAR >>SYSTEM. 17:09 HE DOES NOT WANT ANNO DOMINI, THE YEAR OF OUR LORD. 17:12 ISLAMIC FUNDAMENTALIST, >>THAT'S THE FIRST THING THEY DO, >>THEY CHANGE THE TIME. 17:19 IT BECOMES A.H. AFTER THE HEGIRAE. 17:24 THEY CHANGE THE CALENDAR AND THE LAW TO MAKE SHARI'AH LAW BECOME THE LAW OF THE LAND. 17:34 THERE WILL BE AMPUTATIONS FOR PEOPLE WHO LEAVE ISLAM. 17:40 THEY WANT TO DO THIS IN AMERICA. 17:41 THAT'S RIGHT IF THEY CAN GET AWAY WITH IT. 17:43 IN CANADA THEY'RE BEGINNING SOME >>WAYS OF ESTABLISHING SHARI'AH LAW FOR MUSLIMS. 17:51 REGARDING THEIR ALMS OR >>REGARDING MARRIAGE OR DIVORCES. 17:55 I'VE GOT NO PROBLEM WITH WOMEN >>THAT WANT TO WEAR THE VEIL. 17:58 THAT'S UP TO EVERY INDIVIDUAL. 18:04 AND WHAT THEY ARE CAUSING IN THE >>MIDDLE EAST. 18:06 WE GOT TO DEFEND THAT FROM JIHAD. 18:09 WE GOT TO TAKE JIHAD OUT OF ISLAM. 18:11 WE CAN'T LEAVE JIHAD AS PART OF SHARI'AH. 18:19 WHERE ALL THE CONTESTANTS WERE >>WOMEN WEARING KADORS. 18:27 I GUESS THE GIRLS HAD TO FLASH >>THEIR EYES. 18:30 THAT'S WHAT WE HAD. 18:32 IT'S SUCH AN OLD, ANCIENT, WEIRD, PRIMITIVE SYSTEM. 18:36 CAN'T THEY SEE THAT IT DOES NOT >>FIT IN THIS WORLD TODAY? 18:39 MANY MODERATE MUSLIMS DON'T >>BELIEVE THAT COVERING THE FACE >>IS PART OF ISLAM AT ALL. 18:45 IT'S COVERING THE HAIR. 18:46 EXECUTIONS OF YOUNG GIRLS >>BECAUSE THEY WENT ON A DATE OR >>KISSED SOMEBODY GOOD NIGHT. 18:53 WOMEN INHERIT HALF OF WHAT MEN INHERIT. 18:56 THE TESTIMONY IS HALF THE TESTIMONY OF A MAN. 18:58 THIS IS WHY, IT SAYS, HE DOES >>NOT HONOR THE DESIRE OF WOMEN. 19:02 THAT'S PART OF THE ANTICHRIST ISN'T IT? 19:04 IT'S PART OF THE ANTICHRIST SYSTEM. 19:06 I'M GLAD YOU TAUGHT ME THAT. 19:07 IT'S SO SIMPLE AND IT DOES FIT THAT. 19:09 IT'S BEEN WRITTEN FOR SHEPHERDS >>AND FARMERS, ZOLA. 19:15 AND THAT ANSWERS TO WHY THEY NEVER DO UNDERSTAND. 19:18 LET'S GO BACK TO THE TEMPLE AND >>ITS DESTRUCTIONS AND SO ON. 19:24 YOU ALWAYS HAVE SUCH INTERESTING >>THINGS TO SAY. 19:31 BUT WERE THERE ARABS OF THIS MENTALITY IN THE WORLD BACK THEN? 19:41 THE MOON GOD WAS THERE. 19:42 THE SECOND HOLIEST CITY IN ISLAM. 19:43 WERE THEY WORKING ON EGYPT AT THAT TIME, BECAUSE THEY HAVE FINALLY CONQUERED EGYPT? 19:48 IT TOOK A LONG TIME. >>THAT'S RIGHT. 19:49 THEY TRIED TO WORSHIP OF MUDACH >>AND THAT WAS NOT PALATABLE TO THAT REGION. 20:02 AS NABONIDUS DID, THE SON OF NEBUCHADNEZZAR. 20:05 IT WAS CALLED THE SECOND BABYLON. 20:08 YOU CAN FIND THAT IN THE ORACLES >>OF NABONIDUS. 20:09 THIS IS WHY THE BIBLE CALLS IT THE DAUGHTER OF BABYLON, WHICH >>HAS BEEN BORN FROM BABYLON. 20:20 YOU FIND TREMENDOUS SIMILARITIES >>BETWEEN THE TWO. 20:24 NUMBER ONE, YOU HAVE TO HAVE SLAVERY FROM THAT CITY, THAT PLACE. 20:28 THERE'S NO PLACE ON EARTH THAT >>HAS SLAVERY. 20:31 THERE IS SLAVERY IN SAUDI ARABIA. 20:33 AND SUDAN AND PLACES LIKE THAT. 20:37 IT HAS TO BE A DESERT. 20:41 AND IT HAS TO BE SURROUNDED BY MANY WATER. 20:55 BECAUSE NO ONE BUYS THEIR MERCHANDISE ANY LONGER. 20:59 THAT MEANS THEIR MERCHANDISE ARE OBSOLETE. WHY? 21:02 BECAUSE THE OIL WEALTH IS GONE. 21:06 ALL THE KINGS OF THE EARTH WAXED >>RICH FROM IT'S DELICACY. 21:09 ROME DOESN'T HAVE SUCH A >>DELICACY, SO IT CAN'T BE ROME. 21:13 PLUS ROME, VATICAN CITY SITS ON ONE HILL. 21:15 THERE'S OTHER 7 HILLS OF ROME >>BUT ALSO MECCA SITS ON 7 HILLS, >>AS WELL. 21:21 IT'S A CITY OF 7 HILLS, AS WELL. 21:24 I HAVE WRITTEN IN MY BOOK "WHY I LEFT JIHAD"
21:26 TREMENDOUS AMOUNT OF DETAIL TO COMPARE WHICH ONE FITS BETTER, >>SAUDI ARABIA OR ROME. 21:33 SO WE HAVE TEMPLES GALORE, >>TEMPLE OF UR OF THE CHALDEANS, >>IT'S SIMILAR. 21:37 THE TEMPLE IN JERUSALEM RIGHT NOW IS, WE HAVE THE MUSLIM STRUCTURE. 21:54 IT MATCHES PERFECTLY AS A TEMPLE >>IN BAALBAK IN LEBANON. 22:00 AND THE TEMPLE OF BAALBAK, >>IT MATCHES PERFECTLY THAT ONE. 22:04 SO WE KNOW THE STRUCTURE THEY >>HAVE NOW IS A ROMAN STRUCTURE. 22:07 THEY BUILT IT ON THE ROMAN PILLARS FROM THE TEMPLE OF JUPITER. 22:12 AND NOW THEY'RE TRYING TO BUILD THE LARGEST MOSQUE OVER THERE IN >>THE SOUTHERN AREA. 22:16 BUT, I THINK THAT THEY'RE >>BUILDING IT IN THE WRONG PLACE. 22:20 YES, IT'S TOO FAR SOUTH ON THE MOUNT. 22:22 TOO FAR SOUTH ON THE MOUNT. 22:23 I HAVE QUESTIONS ABOUT IT. 22:29 CAUSED THE WALLS TO START TO BULGE. 22:34 THERE WERE SCAFFOLDS ON THE WALLS ON THE SOUTH AND EASTERN SIDE. 22:41 TO TAKE OUT OLD PILLARS FROM A >>STONE PLATFORM WITH A HEAVY BUILDING ON TOP? 22:48 I WAS IN THERE IN 1973 WHEN YOU >>WERE BAR MITZVAH. 22:58 AND THERE WERE PILLARS AND MORE PILLARS. 23:01 IT WAS A ROOM OF PILLARS. 23:02 AND THEY TIED HORSES, APPARENTLY, THE CRUSADERS, ON SOME OF THE PILLARS. 23:05 BUT, ANYONE COULD SEE THAT THESE >>PILLARS DID A JOB. 23:10 THEY WERE HOLDING UP THE PLATFORM. 23:13 YOU CAN'T JUST WILLY-NILLY TAKE >>THEM OUT SO YOU CAN HAVE AN OPEN SPACE. 23:16 AND GUESS WHAT, IF IT ALL COLLAPSES, IT'S YOUR FAULT. 23:20 WHAT SCARED ME WAS 2 YEARS AGO >>THEY WERE SAYING, DON'T WORRY IT'S NOTHING, WE'RE ON IT. 23:26 THE WALLS ARE NOT GOING TO FALL. 23:29 LAST YEAR THEY STARTED TO SAY THE ISRAELIS ARE SABOTAGING THE WALLS. 23:33 I MEAN THAT'S WHAT SCARES ME. 23:38 THE THIRD HOLIEST PLACE AS MUSLIMS CLAIM. 23:46 INDEED ABRAHAM BUILT MECCA? 23:50 AND SAY, OK, NOW WE'VE GOT A RIGHT TO GO AND DO PILGRIM IN MECCA. 23:55 GO RIGHT TO GO TO MECCA AND DO >>ALL KINDS OF THINGS. 24:03 A STAR OF DAVID. 24:04 AND LET'S GO FURTHER. 24:05 LET'S NOT ALLOW ANY MUSLIM ARAB >>TO ENTER THAT COMPOUND. 24:10 THAT'S THE WAY THEY ACT IN JERUSALEM. 24:12 WHAT DO YOU THINK WOULD HAPPEN? 24:13 YOU WILL WORLD WAR 3. >>EXACTLY. 24:15 BUT YOU DON'T HAVE WORLD WAR 3. 24:17 THE JEWISH PEOPLE HAVE TO BE SILENT. 24:18 THE DESTRUCTION OF JOSEPH'S TOMB, ISRAEL WAS SILENT. 24:21 DO YOU HEAR ANYONE MAKING A PEEP >>OVER JOSEPH'S TOMB? 24:24 I CALL IT JOSEPHNACHT, LIKE YOU SAY KRISTALLNACHT. 24:29 THE DAY WHEN JOSEPH'S TOMB GOT DESTROYED ACCORDING TO PSALM 74. 24:34 THIS IS A TOMB THAT'S ARGUABLY >>4000 YEARS OLD. 24:39 AND THEY TEAR IT APART. >>JUST TEAR IT APART. 24:41 JUST DECIDE TO TEAR IT UP. >>THAT'S RIGHT. 24:43 THIS IS LIKE THE, WHEN THE >>TALIBAN BOMBED THE BIG BUDDHISH >>STATUES. 24:59 AND THEY SEE WHAT'S HAPPENED TO THEIR COUNTRY, TO THEIR SOCIETY. 25:02 THEY SEE THE DESTRUCTION, ALL THE THINGS THAT HAPPEN. 25:08 WE LIVE IN VERY DANGEROUS TIMES. 25:13 I THINK WE HAVE SOME TIME LEFT. 25:15 I DON'T KNOW WHEN. 25:16 WE DON'T KNOW THE TIME, BUT WE CAN SEE THE WRITING ON THE WALLS. 25:19 YES, WE SURE CAN. 25:31 AND THE 3RD ONE, THE SITE IS BEING SO DISTURBED. 25:38 THERE WILL BE GLORIOUS TEMPLES >>REBUILT. 25:40 THE TRIBULATION TEMPLE AND YOU >>SAY IT WILL BE REFURBISHED AS THE MILLENNIAL TEMPLE. 25:47 OTHERS SAY THERE WILL BE A SEPARATE TEMPLE. 25:53 IS THE IMPORTANT PART ALL THROUGH THE 1000 YEARS. 25:57 AND HE WILL ENTER INTO THE GATE >>IN THE EAST. 26:06 GUESS WHAT, WE LOST THE CITY OF >>JERUSALEM IN 1918. 26:09 THE OTTOMAN EMPIRE, 67. 26:14 AND GET PEOPLE COMING RIGHT DIRECTLY TO THE TEMPLE MOUNT. 26:16 ALL THESE THINGS ARE SPELLED OUT IN HIS BOOK "WHY I LEFT JIHAD". 26:28 BUT A PALESTINIAN TERRORIST, A BOMB CARRYING TERRORIST WITH A HEART. 26:33 GOD REACHED IN AND GOT THAT HEART. 26:36 SO, LOOK ON HIS WEBSITE, SHOEBAT.COM. 26:40 AND HAVE HIM SPEAK, WILL YOU. 26:43 HE GOES ON SPEAKING TOURS AND HE'S SPEAKING IN SYNAGOGUES. 26:46 LET'S HEAR FROM HIM IN THE CHURCH. 26:47 SHA'ALU SHALOM YERUSHALYIM, >>PRAY FOR THE PEACE OF JERUSALEM.